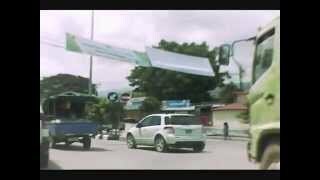 S -8° 33' 30" and E 125° 34' 24"
Dili in Vera Cruz (Díli) with it's 150,000 habitants is a city located in East Timor. It's the capital of this country. Current time in Dili is now 10:08 AM (Monday). The local timezone is named Asia / Dili with an UTC offset of 9 hours. We know of 8 airports closer to Dili. The closest airport in East Timor is Presidente Nicolau Lobato International Airport in a distance of 3 mi (or 5 km), West. Besides the airports, there are other travel options available (check left side). Since you are here already, you might want to pay a visit to some of the following locations: Aileu, Liquica, Ainaro, Manatuto and Same. To further explore this place, just scroll down and browse the available info. Let's start with some photos from the area. Alguns movimentos em Dili em vídeo caseiro..
Um passeio rápido em Dili no domingo de páscoa. Driving through Dili, Timor-Leste on a lazy Sunday afternoon, we encountered hundreds of kids on bikes. Pedal power! 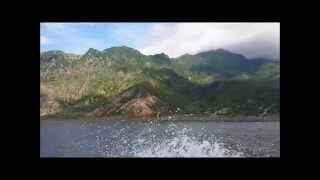 We encountered a pod of dolphins on our way back to Dili, Timor-Leste from Atauro Island! 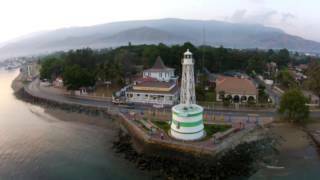 Dili is the capital, largest city, chief port and commercial center of East Timor. Located at -8.55, 125.583 (Lat. / Lng. ), about 1 miles away. The National Parliament is the unicameral national legislature in East Timor. It was created in 2001 as the Constituent Assembly while the country was still under the supervision of the United Nations, but renamed itself to the National Parliament with the attaining of national independence on May 20, 2002. Located at -8.55472, 125.579 (Lat. / Lng. ), about 0 miles away. National Stadium is a multi-purpose stadium in Dili, East Timor. It is used mostly for association football matches. The stadium holds 5,000, but has never hosted an international match. In 2002 The Dili stadium hosted Kylie Minogue and John Farnham as a reward for the Australians Serving in assisting towards independence. Until recently the stadium has been neglected in Dili and in 2006 housed thousands of East Timorese fleeing violence on the streets. Located at -8.55794, 125.581 (Lat. / Lng. ), about 1 miles away. Presidente Nicolau Lobato International Airport, formerly known as Comoro International Airport, is an airport located in Dili, the capital of East Timor. The airport was renamed after Nicolau dos Reis Lobato, an East Timorese politician and national hero. Located at -8.54655, 125.525 (Lat. / Lng. ), about 3 miles away. 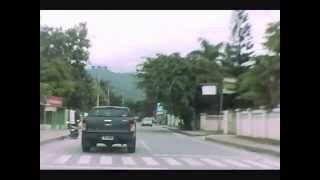 Metinaro is a city in Dili District, East Timor. The coast has a wonderful diving area with a colourful world of animals. 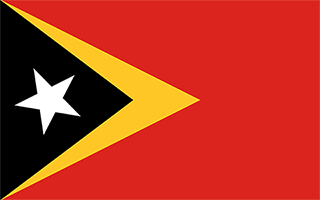 Metinaro is also the home of the East Timor's 1st Battalion F-FDTL. Located at the Metinaro Barracks is also the Recruit Training Centre and the Defence Force School of Languages (Defence Cooperation Programme - Australia). The Australian Army assists the F-FDTL with training and expertise. The 2nd Battalion is located at Baucau, some 1 hours drive to the East. Located at -8.53333, 125.733 (Lat. / Lng. ), about 11 miles away. The Comoro River is a river in East Timor. It flows north into the Wetar Strait, reaching the sea to the west of the capital, Dili. Located at -8.59611, 125.537 (Lat. / Lng. ), about 4 miles away. Cristo Rei of Dili is an 88.6-foot-high statue of Jesus located atop a globe in Dili, East Timor. The statue was designed by Mochamad Syailillah, who is better known as Bolil. The statue was officially unveiled by Suharto in 1996 as gift from the Indonesian government to the people of East Timor, which was at the time still a province. The statue is one of the main tourist attractions in East Timor. Located at -8.52028, 125.608 (Lat. / Lng. ), about 4 miles away. The Immaculate Conception Cathedral, Dili is the main church of the Roman Catholic Diocese of Dili, East Timor. Located at -8.55833, 125.567 (Lat. / Lng. ), about 0 miles away. Laulara is a town and subdistrict in the Aileu District of East Timor. Its population at the 2004 census was 5,448. Located at -8.60306, 125.594 (Lat. / Lng. ), about 3 miles away. Lequidoe is a town and subdistrict in the Aileu District of East Timor. Its population at the 2004 census was 5,819. Located at -8.69139, 125.636 (Lat. / Lng. ), about 10 miles away. Remexio is a town and subdistrict in the Aileu District of East Timor. Its population at the 2004 census was 9.493. Located at -8.61667, 125.667 (Lat. / Lng. ), about 8 miles away. Cristo Rei is a subdistrict in the Dili District of East Timor. Its population at the 2010 census was 54,936. Located at -8.53333, 125.683 (Lat. / Lng. ), about 8 miles away. 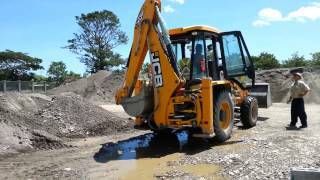 Dom Aleixo is a subdistrict in the east of Dili District of East Timor, at the mouth of Comoro River. It is named after Aleixo Corte-Real. Its population at the 2010 census was 105,154. Its area is 33,12 km². The Sucos of Dom Aleixo are Bairro Pite, Comoro, Fatuhada and Kampung Alor. Here are the Presidente Nicolau Lobato International Airport, the ministry for foreign affairs and the main mosque of East Timor. The Tasitolu salt lakes are in the most western part of Dom Aleio in Comoro Suco. Located at -8.54667, 125.525 (Lat. / Lng. ), about 3 miles away. Railaco is a town and subdistrict in the Ermera District of East Timor. Its population at the 2004 census was 9,293. Located at -8.67194, 125.426 (Lat. / Lng. ), about 13 miles away. Palácio de Lahane (Lahane Palace) is an historic building in East Timor. It was once the residence of the Portuguese governors of Portuguese Timor, including Governor Afonso de Castro (1859 to 1861 and from 1862 to 1863). It was located a mile south of the center of the colonial capital of Dili in the mountains. The residence is now a one-story, pink-colored building with octagonal towers at each corner. Located at -8.57417, 125.584 (Lat. / Lng. ), about 1 miles away. 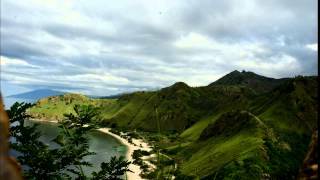 Saboria is a suco in Aileu subdistrict, Aileu District, East Timor. The administrative area covers an area of 22.14 square kilometres and at the time of the 2010 census it had a population of 713 people. Located at -8.71667, 125.583 (Lat. / Lng. ), about 11 miles away. These districts belong to Dili. These are districts that are close by, but belong to a different city than Dili. These are some bigger and more relevant cities in the wider vivinity of Dili. These are the most popular locations in East Timor on Tripmondo.